Ma'a Nonu is benefitting from being back in the All Blacks' environment, putting behind him his indifferent Super Rugby form for the Highlanders after being selected for the first Gallaher Cup Test against France at Eden Park in Auckland on Saturday night. Nonu gradually worked himself into the game and he played a key role in the second try with an impressive line break in the move capped by Sam Cane's touchdown. 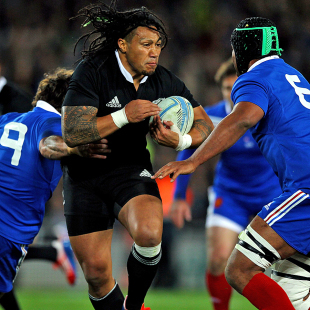 "I wanted to get into the game early," Nonu said. "It hasn't been a great year, I would admit that. I worked a lot harder this week in terms of being in this environment, and I guess it is good to be in the All Blacks where you get all the help you need. I thought I had a few good patches of play but am still a bit rusty. I dropped a few balls, but some of the calls I wouldn't agree with but that's the way it goes." Nonu said he had to keep performing, as he couldn't look for his record to gain continued All Blacks selection. And he said "I think as you get older as a player you have to get stronger mentally". The centre recognised that France midfielders Wesley Fofana and Florian Fritz had put pressure on the All Blacks with their line breaks at Eden Park, and he noted the tourists still had Mathieu Bastareaud in the wings so the challenge would only get tougher in the second and third Tests. "I had seen Fofana play a few times watching Sky [television]. I think he's a great player, a good runner with the ball, and defensively he played well in the last Six Nations. I guess you can't take the opposition for granted. Our opposition is getting stronger and stronger so you just have to keep playing well."